"Later I go looking for the beach whch is Da Nang's main attraction. Well, looks like that aint happening today so I head back and stop at a local street resto for a beer. Not long before a group of men in their 30s are beckoning me over. Im cautious but I accept. They turn out to be engineers and are perfectly legit. They invite me to share their seafood hotpot and I spend the next 4 hrs drinking beer and eating with them. Eventually they have to go home to their families about 6pm. I try to give my share of the bill but they won't have it. So generous." Danang is located in the tropics and knows monsoons. The temperature is high and constant. Danang is on the border between two climatic zones, with its temperate climate in the north, but Danang itself is still tropical. There are two seasons: a long rainy season from August to December and a dry season from January to July. Occasionally there is even a hint of winter, but it never lasts long. The average annual temperature is 26 � C. From June to August the temperature is the highest: an average of 28 � to 30 � C. The coldest wearher is from December to February with an average of 18 � to 23 � C. In the jungle around the Ba Na mountain it has temperatures average 20 � C at an altitude of about 1500 m.
The town lies on the Han River. To the east lies the South China Sea with beaches and the Son Tra peninsula. In the north and west are mountains. 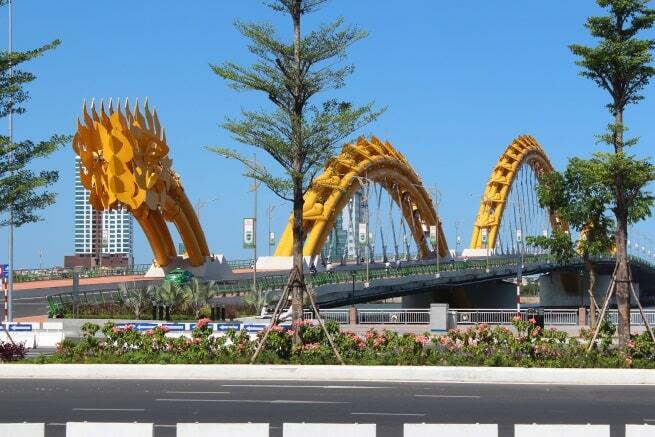 Da Nang is located midway between the capital in the north, Hanoi and Ho Chi Minh City in the south. It is the fourth largest city in Vietnam. Apart from a number of shops highlights and historic sites, the main reason for most travelers is to stay near the famous China Beach, Lang Co Beach, Hoi An and My Son. Lang Co Beach is surrounded by palm trees. The waters of the nearby ocean is crystal clear and enticing and the beach has white sand. It is the Son Tra peninsula with a sparkling lagoon on one side and the beach on the other side. The peninsula is located 13 kilometers south of Da Nang and is relatively underdeveloped, but in recent years there have been opened many new hotels. Behind the beach is a mysterious primitive jungle with a wide diversity of plants and animals. China Beach is more developed, because it was a popular place for American soldiers in search of rest and relaxation during the Vietnam - American War. There are plentiful water sports activities and it can be very crowded on weekends and holidays. 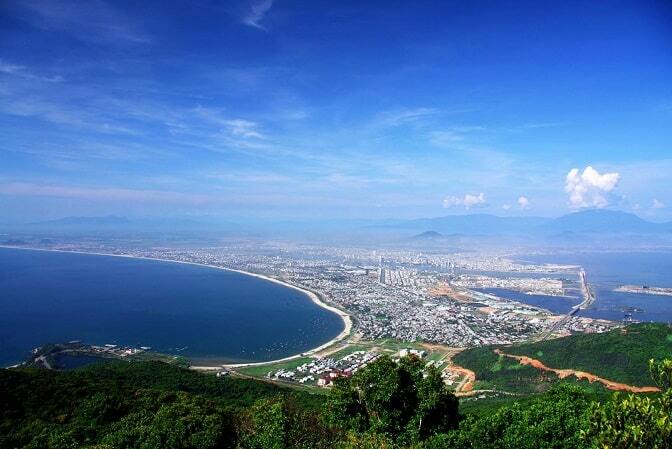 The coastline stretches from Da Nang is 30 kilometers long. It is known for its calm, cool waters and it is also popular for fishing, water skiing, diving and sailing. Da Nang is a transportation hub for the central coast of Vietnam and as such is easily accessible by plane, bus or train. Danang Railway Station is just outside the center of town. From here the Reunification Express train departs to north or south. There are plenty of taxis and moto-taxis waiting outside the station. If you can, try and grab a Mai Linh car, this is one of the few reliable taxi companies in Vietnam. Da Nang bus station is a few kilometers from the center. Here you can come up with a local bus. After the local bus you will probably have a sleeper switch to another great place. The international airport is almost in the city, about 3 km from the center. There are regular flights from Hanoi to Da Nang and Ho Chi Minh City for about $ 30. Domestic flights are going to Da Lat, Hai Phong, Nha Trang and Pleiku. International flights go from Da Nang to include Guangzhou, Seoul, Kuala Lumpur, Shanghai, Siem Reap, Singapore, Taipei and Tokyo. Nowhere Vietnam is changing so rapidly as in Danang. For decades it had a reputation as a backward provincial town, but the big changes are underway. As you wander along the Han River, you'll see shiny new modern hotels, apartments and restaurants. Spectacular new bridges now span the Han River. The whole China Beach strip is booming with hotels and resorts. That said, the town itself still has some attractions. There is a very decent museum with beautiful old Cham sculptures and a stunningly quirky bridge. So for most travelers who want to enjoy the beaches, restaurants and nightlife, Da Nang has enough to offer a few days. You can book an evening excursion by Danang to see the gleaming neon lights. At street stalls they have delicious food. In the southern part of the city are the Marble Mountains. 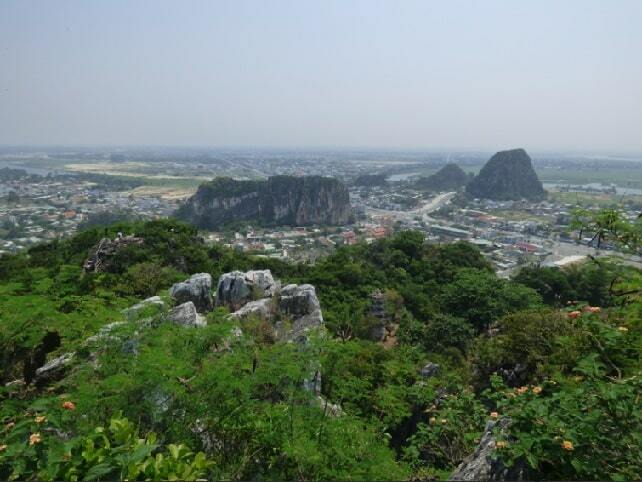 These are five from the area towering mounds of marble and limestone hills. The five "heaps" are named after the five elements; metal, water, wood, fire and earth. All of these little mountains have numerous caves and tunnels. It is possible to climb to one of the tops. There are also several Buddhist shrines in the hills, making it a famous tourist destination (see Danang Highlights).